Things are doing well now, but remember when Mom had surgery? She still doesn't feel good enough to travel this weekend to Egypt, so she'll probably come a week later, which I'm not real happy with. Moving into a new house in Egypt without your Mom for the first week isn't so great, do you all have any advice? :D Well, just pray that she'd be able to come with us, though it probably won't happen. Oh, and I got my own laptop! I'm really happy, I was going save for one but I didn't have enough money, so I was just going to use the family one. Now I have my own, though the internet doesn't work yet. 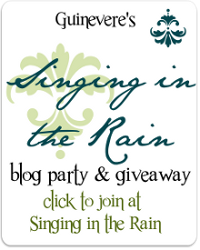 Guinevere is hosting a blog party, so I decided to join. 2. What is your favorite part of autumn? It's not that hot. 4. Describe your dream house. I like traveling, though that's not really a house, but I would like to live in the woods, I don't mind how the house looks. 9. The worst grammatical mistake, in your opinion: Umm....I don't like it when people do their 'I's like this: "When i was going to the store i saw...."
10. If you had a choice, would you want to live: in the mountains, in a rainforest, on a prairie, or by the beach? The mountains! 11. What character from a book would you say you are most like? Andi Carter, maybe a little of Anne, but I don't worry about my hair at ALL. 12. Be constantly talking the rest of your life or not be able to communicate in any way for the rest of your life? Be constantly talking, I guess! 13. Owl City or Switchfoot? What?? 14. Taylor Swift of Selena Gomez? What?? 17. How are you educated? (i.e. homeschooled, public schooled, private schooled) Home schooled, it rocks! 19. What's your favorite song? I like a lot, and they change ALL the time, right now I like 'Lead me to the Cross' by Chris and Conrad. That's all, I'll post more soon! I like the picture I took! Come visit my blog anytime!